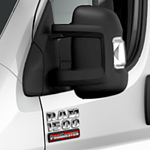 The Ram ProMaster is a van that brings your business to the customer. Its nearly 90-degree vertical walls allow more optimized space for outfits and stacks of equipment, and the interior cargo height of 65.4 inches lets you stand straight up in the cargo area while allowing for taller upfits. You’ll access anything that you’re carrying more easily with 49-inch openings on the side and 60-inch openings in the back. The 3.6L Pentastar® V6 delivers up to 280 horsepower while allowing for a maximum payload of 4,440 lbs. and towing up to 5,100 lbs., thanks to Variable Valve Timing. Offering smaller steps between gear ratios for silkier driving, the 62TE six-speed transmission comes standard. If the specs of the Ram ProMaster impress you on paper, it’s time to find out how they are in real life. Take one for a test drive by spending some time at Mojave Auto Group today.